I was out and about doing some candid carnvial photography a few weeks back and am just getting them together. I really couldn't decide on which one to post, so I went with all three. 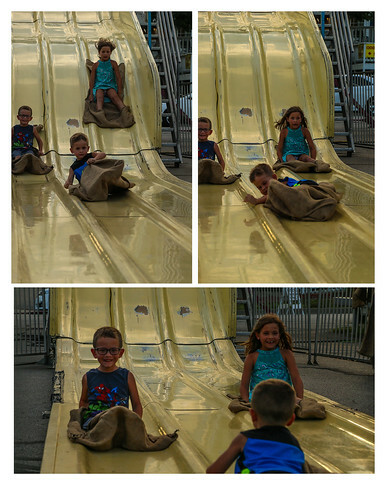 The faces on these kids as they raced down the slide were priceless. I'm not sure how these travelling carnivals stay in business as I witnessed numerous occassions that people could have easily been injured. For instance at the end of this slide is a small mat and then it's concrete. Kids one after the other landed on the concrete but with just minor bumps and scraps. The other time was a scrambler type of ride where it whirls two passengers back and forth. The guy operating the ride didn't seat belt them in and was about to start the ride when the girls in the car screamed out to him. Oh my.